Please be advised that if you have a battery operated smoke detector you will be required to remove the smoke detector from the ceiling so that it can be inspected by the Code Enforcement Officer so that he can determine if the correct detector was installed. Therefore, please be prepared to have a ladder available for the inspection. It shall be the owners / owner’s representatives’ responsibility to remove and re-install the smoke detector at the time of the inspection. Please review all of the requirements for smoke detectors and carbon monoxide detectors on the attached sheet. Please review the requirements for fire extinguishers as there are several regulations regarding size and installation that must be followed. 2. Outside of each separate sleeping area. 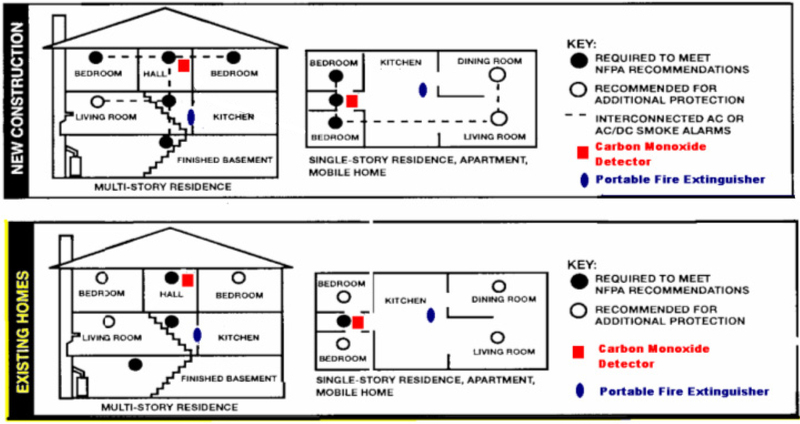 (b) The smoke alarms required in (a) above shall be located and maintained in accordance with NFPA 72. 1. The alarms shall not be required to be interconnected. (c) Ten-year sealed battery-powered single station smoke alarms shall be installed and shall be listed in accordance with ANSI/UL 217, incorporated herein by reference. However, A/C-powered single or multiple-station smoke alarms installed as part of the original construction or rehabilitation project shall not be replaced with battery-powered smoke alarms.The effective date of this subsection shall be January 1, 2019. 1. A/C-powered smoke alarms shall be accepted as meeting the requirements of this section. 1. Single station carbon monoxide alarms shall be installed and maintained in the immediate vicinity of the sleeping area(s). 2. Carbon monoxide alarms may be battery-operated, hard-wired or of the plug-in type and shall be listed and labeled in accordance with UL-2034 and shall be installed in accordance with the requirements of this section and NFPA-720. 7. The top of the extinguisher shall not be more than five feet above the floor. 8. Exception: Portable fire extinguishers shall not be required for seasonal summer units. For purposes of applying this exception, "seasonal summer unit" shall mean a dwelling unit rented for a term of not more than 125 consecutive days for residential purposes by a person having a permanent residence elsewhere, but shall not include use or rental of living quarters by migrant, temporary, or seasonal workers in connection with any work or place where work is being performed.